I read this article and found it very interesting, thought it might be something for you. The article is called Student Loans Jump 15 Times To Rs 48,000 Cr In 9 Years and is located at https://archive.indiaspend.com/sectors/student-loans-jump-15-times-to-rs-48000-cr-in-9-years. Our higher education system rests on the pillars of accessibility, affordability and quality. We now have over 650 degree awarding institutions and over 33,000 colleges in the country. Despite this, there is a gap of quantity as well as quality. For a country the size of India, accessibility of education, particularly post-school, is a major challenge. For millions of young Indians, affording this dream is a bigger obstacle. It’s not uncommon for low & middle income families to pledge their entire savings or even sell assets to send a son or daughter to college. Last month, for instance, IndiaSpend showed how a college degree from Lucknow would be as costly as one from Harvard. Having said that, how are we doing on education funding? The broad numbers first. Data released by Reserve Bank of India (RBI) recently shows that outstanding educational loans has zoomed from Rs 2,986 crore in 2003 to over Rs 48,400 crore in 2012. Public sector banks account for over 90% of the loans disbursed in 2012: Rs 46,740 crore. The data also shows that the number of accounts has been rising sharply. 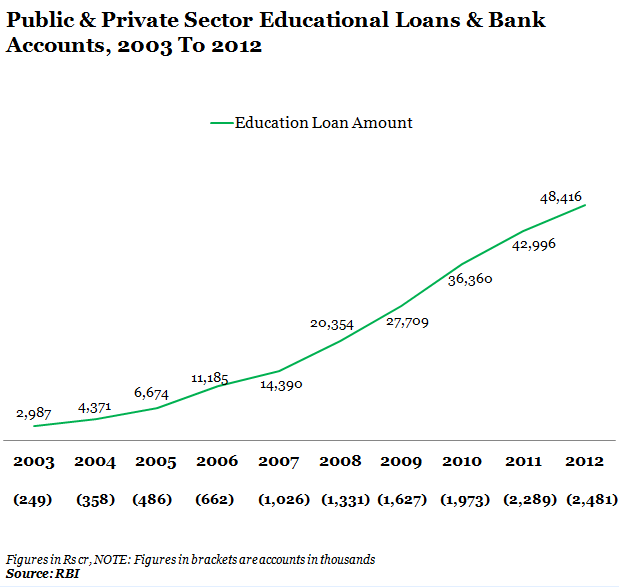 The number of educational loan accounts has zoomed from just 249,000 accounts in 2003to 2,481,000 accounts in 2012. But the gap is still large. Some 20 million students were enrolled in various streams of higher education – arts, science, engineering/technology and medicine – during the academic year 2011. Moreover, there are 315 million young people in India in the age group of 10-24 years, representing 30% of the population. Some 10 million young Indians are likely to join the job market every year for the next five years. Also remember that fees for professional courses for e.g. medicine or engineering could range from Rs 5,000 per year at the Government-run All India Institute of Medical Sciences (AIIMS) to Rs 100,000 at the Indian Institute of Technology (IIT) Bombay or Rs 600,000 per year at a private medical institute like DY Patil College. The flip side is that with an increase in education loans, repayments have also started getting affected. With many firms not hiring freshers and/or offering lower salaries, it is becoming difficult for students to meet the repayment commitments. And it becomes difficult for banks to recover the money in case a student fails to pay back as there are no collaterals against most of the educational loans. So, banks typically try and restructure the loans by stretching the repayment period. 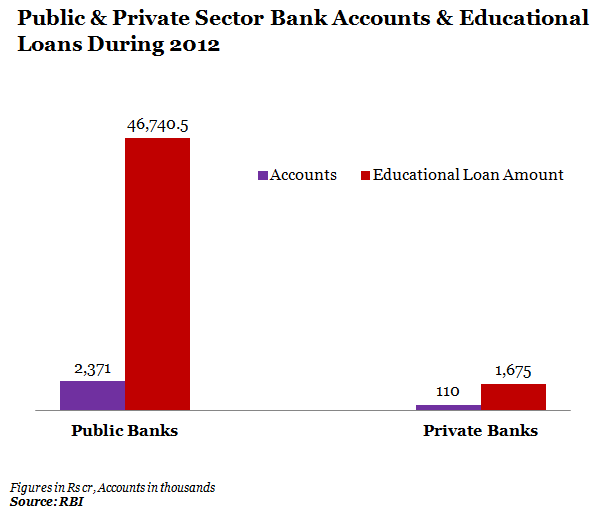 Educational loans are new in India: after the launch in 2001-02, banks started focussing on education loans from 2005. 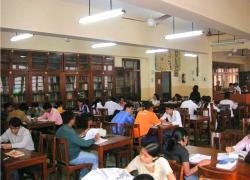 The Government of India, in consultation with Reserve Bank of India (RBI) and Indian Bankers’ Association (IBA) had framed an educational loan scheme to ensure that no deserving student is deprived of higher education for want of finances.The loans cover all type of courses, including professional courses in schools and colleges, in India and abroad. Information provided by University Grants Commission, says the scheme envisages loans up to Rs 7.5 lakh for studies in India and up to Rs 15 lakh for studies abroad. Leading banks like State Bank of India offer loans up to Rs 30 lakh for studying abroad. The current interest rate on loans is around 11.45%-13% per annum. The boom in education loans, and the growing population dividend, has also attracted private players like Credila, an initiative of housing finance major HDFC, that offers loans up to Rs 20 lakh.